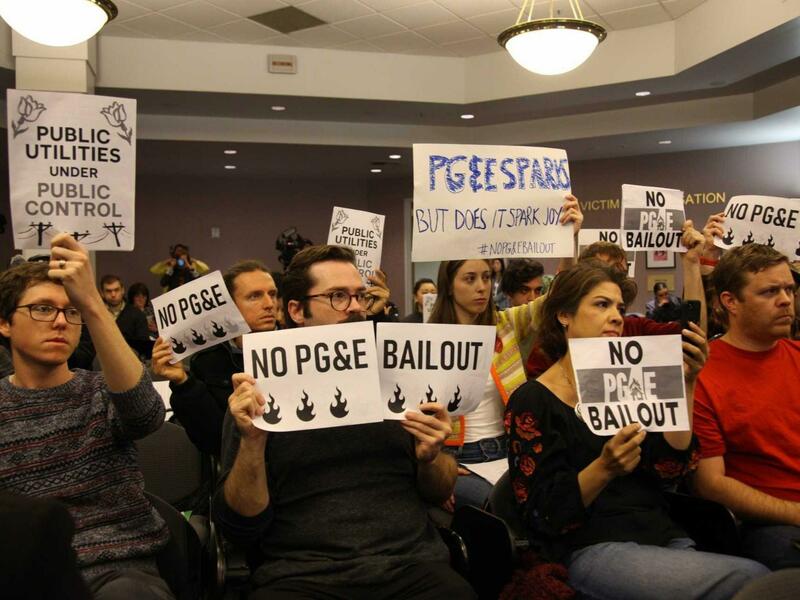 Audience members during public comment at the California Public Utilities Commission meeting Jan. 31 hold signs that say "No PG&E bailout." More tha a dozen protestors urged the California Public Utilities Commission yesterday (Thursday) to prioritize fire victims over PG&E shareholders. Capital Public Radio's Nadine Sebai reports. Now Amid Bankruptcy, Should PG&E Transition From Private Company To Public Utility? PG&E's bankruptcy continues to spur questions on how the path forward will affect California's electricity distriution, customers, and wildfire victims. Capital Public Radio's Randol White has some insights from experts familiar with the situation. PG&E's announcement that it will file for bankruptcy is spurring some California lawmakers to question what the utility should look like when it emerges. KVCR’s Rick Dulock has more.